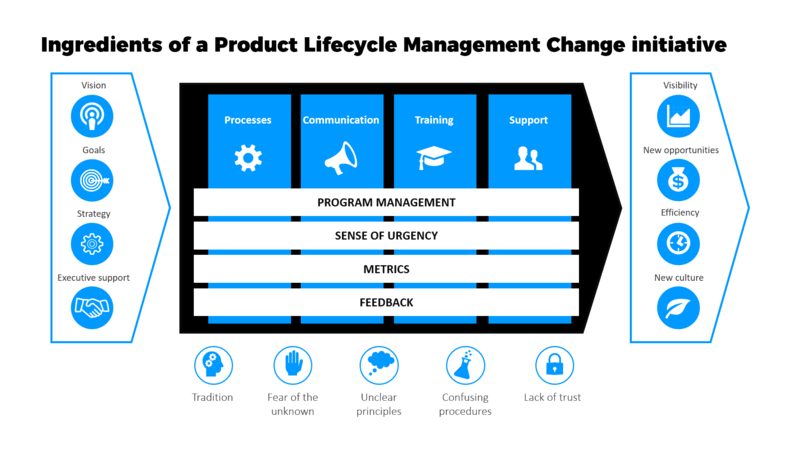 Organizations embarking on a Product Lifecycle Management (PLM) transformation, expect to achieve a step-change in business results. Providing access to clean data, streamlining product development processes or improving efficiency. Organizations set bold expectations to their PLM initiatives – yet after large investments and efforts, they often fail to leverage the promised benefits of PLM. With broad, cross-functional activities spanning processes, systems and culture, PLM transformations are hard to get right. McKinsey & Company’s The Inconvenient Truth About Change Management, states that roughly 70% of all change programs fail. And PLM is no exception. What can we do about it? Is there a secret recipe to address the common threats to successful change? Crafting a compelling vision for the change is key to get your PLM initiative off to a good start. Begin with the result in mind. Your vision is a “picture” of what you aspire to achieve with your PLM transformation program. Your vision must go beyond the change initiative itself. And often beyond the problem it’s solving, to a larger and more meaningful purpose. Articulating your vision statement is the first step to provide direction, inspiration and engagement for the change. A good vision needs to be clear and simple. Try to get rid of buzz words and explain how success looks like, and why it’s worth to change. “Developing better products and better experiences” , “be the first company who is fully digital end-to-end.” or “collaborate with our customers and suppliers with easier data sharing” are examples of visions for your PLM change initiative. Once you have aligned stakeholders behind the vision, set the initiative’s goals and describe how to get there with a well-rounded strategy. By setting sharp, clear goals, you can measure your breakthrough and continuously motivate your organization to progress toward the vision. A good strategy answers the question, “How do we get there?”. Your vision is useless unless it can direct action. Describe how you are going to get things done, and figure out how to achieve your goals. You’ve crafted your vision and defined your strategy: it’s time finally to build your lead team. This group will be in charge of designing the program, communicating the change and ultimately guiding the implementation and rollout, championed by top management. Leadership support is vital for PLM transformation programs. Executive support will make the difference between the success or failure of your PLM initiative. Make sure you count on strong senior leadership support to help you convey the message, and secure the resources you need for your program to run smoothly. Process, communication, training and support are key for your organization to make the change over. Well defined processes, with clear roles and objectives, help people overcome the awkwardness and discomfort of changing their way of working. The new processes need to guide them step-by-step through the change to make it stick. Communication plays a powerful role in an PLM transformation. Regular communications are essential to keep people engaged, get buy-in and commitment. Choose a variety of communication paths to reach your audience. Consider emails, focus groups, webcasts, updates on the company portal or feedback sessions. Be creative. Use multiple channels to communicate the same message once and again. Regular and proactive communication can reduce resistance and make employees feel part of the process. Change initiatives repeatedly fail because of short falls in the training and support strategy. Training sessions are often delivered too far in advance and thus forgotten when the implementation finally arrives. Organize the training sessions as close as you can to the real implementation. Invest in engaging training materials. Make sure you provide the right combination of written documents, video recordings classroom trainings, short use case video-demonstrations and cheat sheets with straight-forward instructions to accomplish relevant tasks. Helping staff, and ensuring they get enough support is equally crucial. Hand-hold your organization through the change, at least during the first months after the implementation. When questions arise, address them rapidly. Nothing will kill a PLM change initiative quicker than a drowsy support system. Program Management is a commanding engine of change when it comes to PLM. A well-organized PLM program, with clear-cut connected initiatives and a strategically thought-through roll-out plan, sets the ground for a successful transformation. To motivate change, you must spell out why the current is not working, and contrast it with the benefits of a better tomorrow. Focus on helping your organization see that they’re dissatisfied with how things are, and that change can make things work. Create a sense of urgency to alert the organization that change must occur here and now. Provide employees a possibility to give feedback and vent their concerns, as well as their compliments. Finally, measure progress with KPIs that relate your vision, goals and objectives. Metrics must focus on key indicators that can gauge the overall health of your transformation program. It is important to celebrate successes along the way as changes are made. Celebrating the small changes and building momentum for bigger changes are what makes employees want to participate in the process. Resistance is a natural part of change. Resistance to change may be rooted in fear, lack of trust or just confusion. Sometimes, employees might be focusing only on their part of the operation, and may fail to see the big picture and recognize the positive impact of the change on the organization Thus, they may find the change disruptive and totally unnecessary. Asking people to change is asking them to move outside their comfort zone. By understanding the resistance causes in your organization, you will be better off to turn fear into cooperation.